Customer Development is a clear and precise approach to the commercialisation of innovation. Steve Blank introduced the Customer Development approach (in full but primarily for enterprise software startups) in his book “Four Steps to the Epiphany”. Company Creation – transitioning from a startup to an executing business. Central to Customer Development is “getting out of the office” and talking to customers (and others involved in the business model, e.g. partners, channel providers). Steve Blank calls these “customer interviews” and they are semi-structured interviews where the initial focus is on gaining insights about the customers (and others involved in the business model) rather than just statistics. These are not just surveys. Customer Development uses the “Business Model Canvas” developed by Alexander Osterwalder to document the hypotheses about all aspects of the business model (e.g. the market segments, value propositions, partners, cost structure, revenue structure). The founders job is then to validate these assumptions via customer interviews or change them (pivot). Web/mobile startups may also use Web analytics (i.e. data about a customer’s interaction with the Web/mobile site) to supplement these interviews. Customer Development is itself a highly iterative and incremental process that includes a number of pivot points. Pivots represent a change in strategy (business model) without generally a change in the vision for the startup. Lean startups are encouraged to pivot if they cannot achieve problem-solution fit or product-market fit or a repeatable and scalable sales process, rather than to continue on with likely failure. 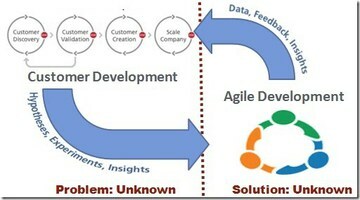 The term Customer Development was coined by Steve Blank.